A group of teenagers look to save their town from an invasion of North Korean soldiers. The city of Spokane, Washington is awakened by a North Korean paratrooper invasion. Marine Corps veteran Jed Eckert and his civilian brother, Matt, escape with a group of friends to an isolated cabin in the woods, where they witness the execution of their father at the hands of the ruthless Captain Cho. The brothers unite with their friends to form a guerrilla resistance group--the Wolverines--to drive the invaders from their home. I like Tim Grierson's review. Grierson: It's not that the movie's hawkish, kill-'em-all attitude is maddening. (Lots of action movies have the same, mindlessly fascist tone.) It's that the film operates under a belief that America is a good and just nation that has never done anything wrong and must always be on the watch for evil countries trying to take down our freedom. Look, I may not be interested in a documentary like 2016: Obama's America, but I can at least understand how a film like that plays into one view of what's going on in the country. But this new Red Dawn is utterly, scarily devoid of a basic understanding of current events. The movie plays up the fact that Jed is a Marine who did a tour of Iraq, which makes him an ideal leader for this ragtag bunch of pretty, vacant people squaring off against scowling North Koreans. But the way that the movie tells it, Jed was in Iraq to do, uh, heroic, awesome things. There's not even one moment in which Red Dawn troubles itself with the notion that perhaps the way Jed and his buds feel about these invading North Koreans is precisely the way the Iraqis felt about him coming to their country. 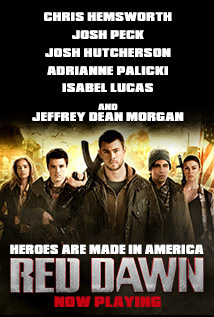 At a time when everything from War of the Worlds to Battlestar Galactica has subversively retold the Iraq story by making the heroes the insurgents, Red Dawn just plows forward, confident in its belief that as long as America is in trouble, we can do whatever the hell we want. The story comes across as amateurish and childish - not to mention ludicrous and politically incorrect. An unnecessary movie to remake. At least in the Swayze version there was a cold war going on. North Koreans have so many problems of their own eg enough food to eat they are hardly going to mount a parachute attack on suburban Pacific Northwest. Most of it felt like paintball in the woods. The cast is bad. Josh Peck and Chris Hemsworth as brothers? Josh looked really daft and his character was so annoying. 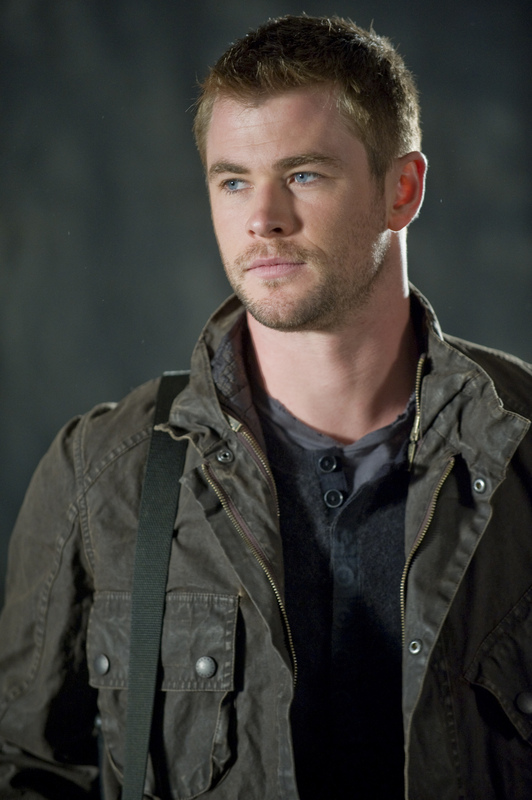 Chris doesn't look good with a crew cut - in fact it makes him look like an overweight redneck. The ladies Isabel and Adrianne looked like they would rather be elsewhere. Poor Will Yun Lee - his biggest role in this drivel. In fact the audience would all be better of being elsewhere than watching this. It feeds the warrior fantasies of adolescent boys with a testosterone-heavy tale of a war free of moral complications. There's no indication that this is anything but set in modern day as of the time of filming/release. No. In the dissolution of the Soviet Union, from 1989 to '91, Russia ceased to be part of it; an event which over time drastically reduced any hostile motives Russia had with the Western bloc, leaving mainly only North Korea and Cuba, as well as (the far more powerful but far less extreme) mainland China, as the remnants of the Cold War and overall arms race (or ideological mockery) between Communists and Westerners. As such, for this story, the Soviet Union has been replaced by North Korea. It was speculated that an ex-Spetsnaz officer (the Spetsnaz being Russian special forces) would be in the film as a trained mercenary, though; yet little was known about him or how much we would see of him in the film. Yes, the People's Republic of China (PRC) was originally presented as the invading regime, but after pressure from the PRC government and studio concerns on how it could impact the international box office, the film was digitally altered in post-production to replace all the PRC flags, posters and dialogue with that of North Korea.